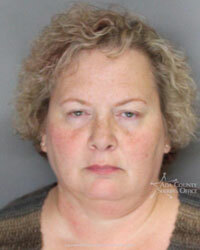 The executive administrator of the Wood River Valley Chapter of the National Alliance on Mental Health was sentenced Monday in Boise to 120 days in jail for a felony conviction of fraudulent possession of a financial transaction card. Sentence for Carla Young was pronounced by Ada County 4th District Court Judge Thomas F. Neville, who further imposed a five-year suspended prison sentence. Also, the judge placed Young on probation for five years and ordered her to participate in a four-week behavior modification program at the Ada County Jail. With completion of the program, Young will be allowed to petition the court to serve the balance of her jail sentence in Blaine County. The judge ruled that she be allowed work release. According to court records, Neville also ordered that Young write a “specific letter stating what you did was wrong” and how it can be avoided in the future. She was ordered to complete 300 hours of community service within the next 36 months. Young pleaded guilty to the charge in August. Young, then 51, was charged with the crime in December 2012 and had been free on $20,000 bond. Young was hired as the local chapter of NAMI’s executive administrator in November 2012. Prior to that, she was employed as the office manager for the Boise Chapter of NAMI. She had retained her position with the Wood River Valley organization since her arrest and guilty plea. Young’s future with the organization was not clear on Tuesday, as NAMI officials had not responded to inquiries from the Idaho Mountain Express regarding her employment status. According to court records, Young had a prior felony conviction in 1995, when she pleaded guilty in Ada County to the crime of “grand theft by unauthorized control.” Ada County court records, available online through the Idaho Supreme Court website, state that for that crime Young was given a suspended five-year prison sentence and placed on probation for five years.